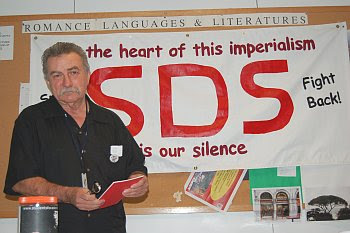 Carl Davidson is a leading US Marxist. He is former member of the '60s radical group Students for a Democratic Society (which spawned the terrorist Weather Underground) and spent many years working in various Maoist organisations. Around 1992 Davidson joined hundreds of former Maoists, Trotskyists and about a third of the Communist Party USA in a new Marxist coalition-the Committees of Correspondence. Davidson remains a leading member of this organisation, now knowns as the Committees of Correspondence for Democracy and Socialism. Davidson serves on the steering committee of the communist dominated US peace umbrella organisation, United for Peace & Justice and is co-chair of the equally radical Chicagoans Against War & Injustice. He is also a major US advocate of radical cyber-activism. In the mid '90s Davidson played a key role in the Chicago branch of the New Party. This was a Marxist led poltical coalition designed to endorse and elect leftist public officials. The bulk of its members came from CoC, the equally radical Democratic Socialists of America and the US's largest militant left grass-roots organisation, ACORN. It was through the New Party that Davidson first met the aspiring Illinois State Senator, Barack Obama. Davidson was an ardent supporter of Obama for several years and helped organise the famous peace rally in Chicago in where Obama pinned his colours to the anti-Iraq war cause. As Obama has modified his (public) anti war position in recent times, Davidson has become somewhat disillusioned with his former hero. He spoke at our first antiwar rally. He spent most of his speech detailing all the wars in history he supported, then finally made a distinction between just wars and 'dumb' wars, and going into Iraq, which was still six months down the road then, was a 'dumb war,' and he flatly opposed it. Good, that put him on our side, and some of us organized a fundraiser for him for his Senate race. The anti War rally was in 2002. Obama's Senate race was in 2004. Giving the current crisis and developments in Congress, he may move back to our side on the war, and get as far as, say, Murtha's position. But right now he's not in the 'Out Now' camp, not as good as Murtha, and a triangulator par excellence. I've watched him do it up close. The press and his publicists put him in our camp, but if you look at his speeches and votes since his trip to Iraq, I think you'll find he has a way to go. Our peace groups here are sending a bunch of us to visit him soon, and get on his case. Perhaps he's still a work in progress, as Jesse Jackson says, but he still has a way to go to get back in my good graces, and those of many more of us here also. Barack Obama is smart enough to know that what worked to mobilise the Chicago Marxist left to cause, will not translate to the national stage. Interesting though that a leading Marxist like Carl Davidson backed Barack Obama for so long. It's amazing that this man is so close to the White House. What's not surprising is that the DNC and the liberal radical activists are so thrilled with him. If there was any doubt that the Democrats (and specifically Obama) agree with Marxism/Socialism/Communism/Collectivism and related oppressive and destructive ideologies there should be no wondering anymore. The "youth" and the rest of the "useful idiots" of this nation who are falling behind him in lock-step and seeing him as a "savior" seriously need to wake up. Thank you for exposing this particular piece of the puzzle. Rather silly to focus on me this way. If Obama even remembers my name, it's as the guy who lobbied him to spend more money on afterschool programs in poor neighbors. By the way, I'm not 'manning' the SDS table in the picture; I stopped to buy a pamphlet. I had my own 'cyber-Marxism' table. And I wouldn't get too worked up about 'Chicago Marxists' either. They're not all that consequential, unfortunately. Besides, everyone there knows the majority of the hard left opposes Obama and any other Democrats as well. Even with me, Obama was my third choice, after Kucinich and Richardson, until they dropped out. If you idea is to suggest Obama is a 'Marxist' or under our spell, that's a hoot. Not even close. Obama is a 'high road' industrial policy capitalist and multipolar globalist--just read his Cooper Union speech a while back. Clinton is a garden-variety corporate liberal capitalist, which got her on the board of Walmart for years. And McCain is a US hegemonist and an unreconstructed neoliberal capitalist--'state all evil, market all good'--that kind that says 'We're in business to make money, not steel, so we'll gut these plants and speculate in oil futures, and the workers and towns be damned.' In other words, the ones who 'cut taxes' by putting everything on the China Visa card and got us into this mess. Actually, truth be told, Obama's brand of capitalism is best for productive businesses, as opposed to most speculators, and does least harm to the working class. That doesn't mean we can't press him to be better at it, as in promoting and building infrastructure for new green businesses and green jobs for youth. All those solar panels and wave and wind turbines have to be built somewhere by someone. Anyway, minus your little 'spin' phrases, there's not much here. I wouldn't bother responding to these guys, Carl... nationalists are rarely interested in intelligent debate. Nationalism is kind of like fascism lite.